I know you’ve all been waiting to hear how things are going at my house since the arrival of my new little sister Allegra last week. Yup, she’s been here an entire week now. Guess she’s here to stay. The first couple of days, I was kind of thinking maybe she was just visiting, but oh well. I’m starting to get used to her. Mom is making sure that I get plenty of attention, and that really helps. In fact, I’m writing this on the laptop – and I mean that literally. I’m on top of Mom’s lap, and typing away on the computer. It’s the best place in the world to be, and for now, it’s all mine. Allegra is taking an after dinner nap in the chair across from us. She hasn’t figured out how to be a lap kitty yet. I know she will sooner or later, and then I’ll have to share again like I did with my sister Buckley, so I’m enjoying this while I can. I’m showing Mom how much I love it with a huge purr while I’m writing this. Anyway – it’s been interesting having this youngster around. It doesn’t take much to amuse her. In her world, everything is a toy, whether it’s the shadow on the wall, the reflection of a prism on the floor, or a Q-tip. As you can see in the photo above, I’m exhausted from just watching her – always on the move, always running around. Unfortunately, she actually thinks she can make friends with me by pouncing on me. I think not! I just hiss at her and if she gets really obnoxious, I swat at her. Mom says she just wants to play and get to know me, but I have to tell you, she better find a less annoying approach to get on my good side. For now, I’m focusing on making sure she knows I’m in charge – make no mistake about that! I can tell that she’s starting to calm down a little, though. The first few days, she was on the go constantly, exploring our house, playing with all the toys we have all over the house, and looking out the windows. She’d barely slow down long enough for Mom to get in a pat or two. The last few days, she’s been more relaxed. I think she’s finally starting to believe that this cool place is really her new home. I know how she feels – I couldn’t believe it either when Mom first brought me here almost ten years ago. There is one very annoying problem, though, and I sure hope Mom figures out a way to make it better. I’m talking about feeding time. Now mind you, I love my food, and I’m a hearty eater. But I like to savor my meals and extend the pleasure by eating a third or half of it, and then come back a little while later to finish the rest. Allegra has no culture whatsoever when it comes to meal time – she just inhales the kitten food Mom puts in front of her. I’ve never seen a cat eat so fast! The bad thing is that when she’s finished with her own dish, she goes after mine (not while I’m eating, though – at least she has more sense that that!). Mom’s been trying to stay on top of things and puts my dish out of reach when I’m done with the first part of my meal, but it’s a problem when Mom can’t keep an eye on things. Like the other day, Mom went out for a while. She said she’d be gone past our dinner time, so she fed fed us before she left. What she doesn’t know is that the second she was out the door, Allegra went and finished everything that was left on my dish. The nerve! But all in all, it’s not so bad. I can tell that Mom is already in love with Allegra, and that makes me happy for her. I know Mom’s heart is big enough to love both of us. I think once Allegra settles down a little bit more, and once she understands that I’m in charge, no if’s, and’s or but’s, I’m going to like having her for my little sister. I know I have a lot to teach her, and I’m not just talking about manners. Thanks for the encouragement, Esme. Amber is working on the food thing. Amber what a sweet story-fear not Magellan is always running around chasing me thinking it is funny to be a boy and jump on top of me. I whack him when I can. You will enjoy the company soon enough-but what is up with Allegra stealing your food and woofing it down. You will have to teach her manners. Thanks, Laura, Zorry and Remy! Marg and MewMew, Amber is all over getting fed more frequently – she loves that suggestion! Lulu, Amber is a bit disheartened hearing that even after five years, Aliza still doesn’t get it, but hopefully, Allegra will be a bit more receptive to training. Bernadette, Cookie’s wisdom is greatly appreciated. 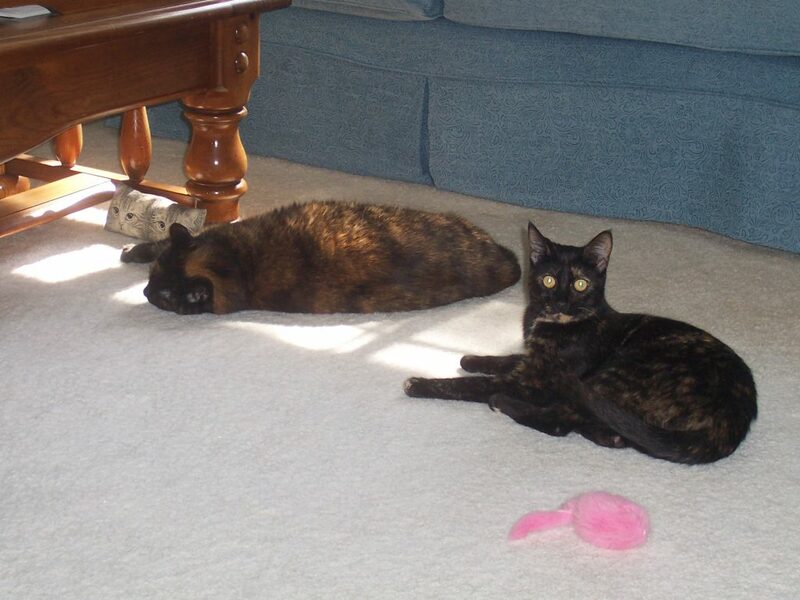 ihavecat, Amber does understand that Allegra wants to be near her – she just wishes she’d be a little less enthusiastic about it! Layla, tell Domino Amber is taking the boot camp offer under serious consideration. Domino here…dearest Amber, if you have any trouble with that young whippersnapper, send her here to feral kitty boot camp and I’ll teach her who’s boss. Awww I really enjoyed reading your post today. It’s a hard job being an older sister isn’t it. Sounds like you are being very patient and that Allegra was probably so high energy b/f because she thought this was a new place to play for the day but didn’t realize it was her HOME and she didn’t have to worry about taking it in all in one day! You will have to teach her culture in the food relm i think….she probably fears not being fed regularly so wants to get as much as she can! Love that picture of the two of you – she wants to be near you! Can’t wait for more updates! Amber, I had a similar experience when my mom brought in Kelly, and I mention this because of the similarity in body shapes all around…I am a goddess-body kitty and move in a stately, dignified manner (except when there’s catnip) but Kelly is just a slender quick little thing. I thought there was something wrong with her when she arrived, and I asked my mom why we needed this scrawny hyperactive tortoiseshell who was obviously defective in some way when we already had a perfectly good full-bodied tortoiseshell in residence. Thirteen years later and it’s all worked out okay; Kelly is a nice girl, though I don’t think she’s gained an ounce since she’s been here. Kelly has always respected my relationship with mom, not like some other cats who’ve come through here. As the grand dame of the household, I have to be understanding. I wish you much luck in training Allegra. I’ve been trying to train Aliza (who’s actually way older than me) for the past five years with not much luck at all. Just yesterday, I was curled up under the covers with mom taking a nap…and Aliza decided she wanted affection from mom, so she stepped on me. She claims she didn’t know I was under the covers. yeah right – boy did I hiss at her! Glad to know things are beginning to calm down and work into a routine. In time I’m sure Allegra will realize there’s always going to be food and not eat so much, so fast. Looking forward to continued updates on her progress. Hi Amber, my name is MewMew and I know just how you feel. You are so lucky to only have one child to train. There are like 7 kittens that I am training right now. It is really tough work. But it sounds like you are doing a good job. Maybe Mom can figure out a way to feed you a little more often so that Allegra doesn’t take all your leftover food. We like to eat often and a little bit at a time. Good luck Amber training that energetic kitten. Have a wonderful day.